Instrumental phase; John apparently bailed due to sickness from increasing addiction to alcohol and other drugs, and no one took the vocal reigns. There is some contention amongst Coil fans as to whether or not these gigs can/should be considered Coil gigs. Personally, I think they count all the same – Peter alone was half the band at any given time. 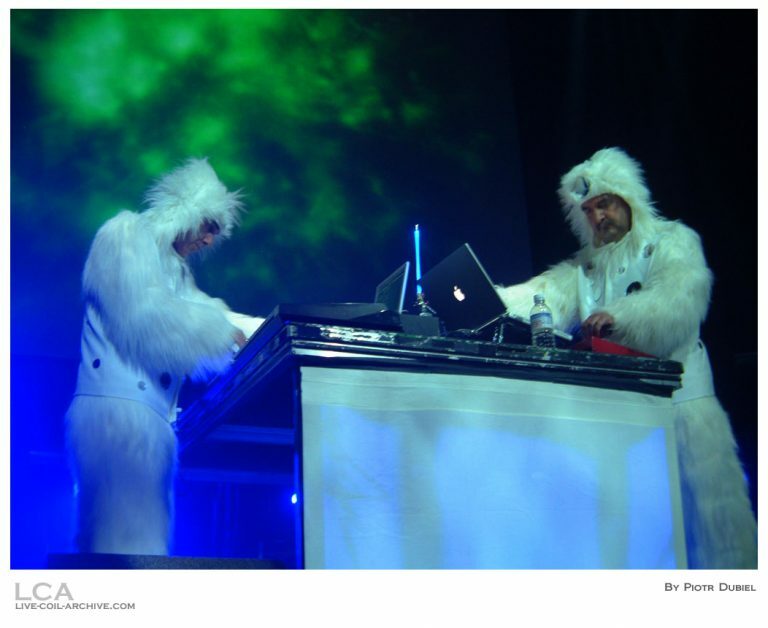 Peter and Thighpaulsandra donned the fluffy suits once again for every show during this particular phase. 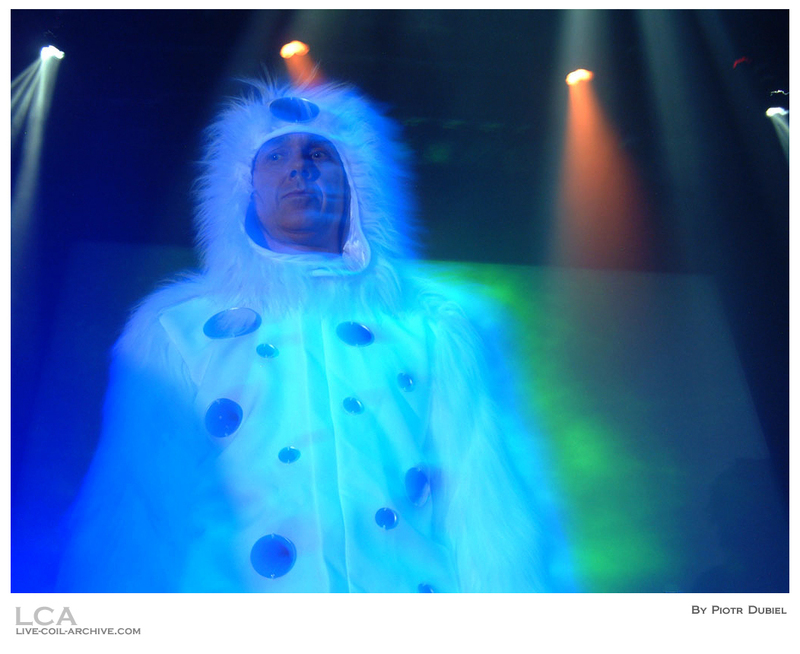 Jon Whitney: Did you design the, uh, the visuals for last night too, and like the strobes and everything like that, or…? P.C. : Pretty much, yeah. I mean, I wasn’t running it on the day, but, you know, we try and get the local crews to follow a kind of basic structure of how that works. The people…at Montreal seemed like they were already good and together. Godo crews, and everything. P.C. : You didn’t have a television until you were 15. J.W. : How did you, uh, you know, tell me some of the groups you were working with and how did you meet up with Coil and get involved with this? T.P.S. 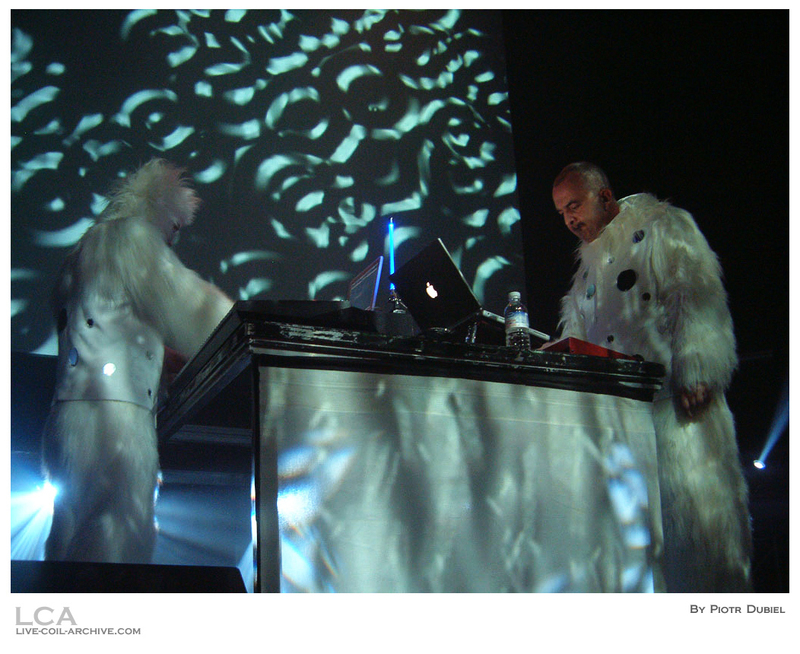 : Uh…I met Coil – well, I was working at the time with Julian Cope, and I’d made a few records with him, and I eventually became the keyboard player in his touring group, and John came to see a show at the Shepherd’s Bush Empire [a music venue in London]. Did you come as well? (P.C. shakes his head) No, no. Just John came, and, uh, he wanted to meet me, so he got in touch with my manager and set up a meeting, and we kind of hit it off from the first day (T.P.S. smiles), I think, and, uh, after we became friends, uh, I was eventually asked to join Coil, which was great (laughs). P.C. : Actually, you’re responsible for Coil playing live, basically. T.P.S. 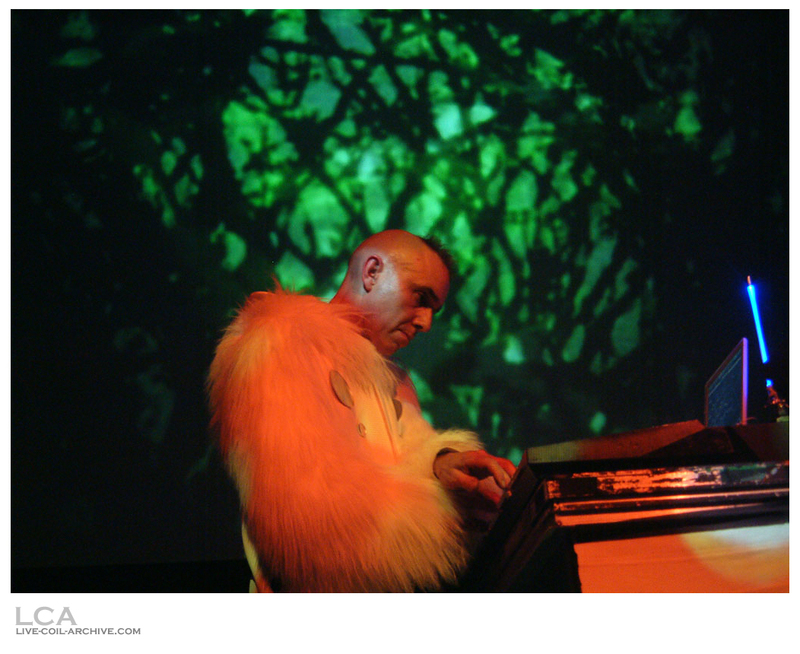 : I am responsible for Coil playing live. So I said, “You’ve got to be able to. It’s so easy, you’ve got to do it,” and many tears have been shed since then (he and P.C. laugh). But, you know, here we are, still doing it, so…Took a lot of arm twisting, though, to make them do it. J.W. : What, um…what do you see Coil becoming, you know, what do you see Coil now as, versus, you know, how Coil was 10, on 20 years ago? You know, you know, how do you see it now and then where do you see it going from here? P.C. : Well, it was, Coil always was a vehicle. I mean, initially, it was, you know, John Balance’s band, and I, he just asked me to help him do some, some stuff, and uh, the main difference right now is I’m not sure how much he wants to do it, or, you know, how much he wants to, to make music, and he tells me that he does, but, um, he’s kinda going through some weird things in his life at the moment. I don’t know if he will continue to do that, or not. I don’t really know if the reason he’s doing it is just to make money, or if he does feel kinda musically motivated. Um, but assuming that, assuming that he does, you know, I’m sure we will continue to work with each other. But because we’ve sort of split up personally (T.P.S. looks down at the table), um, obviously the sort-of dynamic is slightly different. Um, but, you know, the basic motivation for me has always just been whimsical, you know. If…there’s, there’s always kind of new, new stuff coming along that’s interesting, and, and, uh, yeah, I do like making music, I’m sure that I’ll, we’ll continue to do that, you know, whether it’s Coil or whether it’s something else, I don’t know, but, um, I think, you know, one of the things that’s not good for a relationship and just as much as it’s not good for a band is for people to take, you know, take things for granted, take the future for granted, or take, you know any kind of continuity, really, for granted, you know, you, in order to have a stable and fulfilling – not stable – but an interesting relationship, you know, that lasts, you’ve got to, you know, you’ve gotta keep things the way they were when you first met, you know, when you actually can’t put anything else out of your mind except getting into somebody’s pants, and it’s sort of the same with the band, you know, you’ve got to approach your music as though you want to get into its pants, and if you just assume that next year, there’ll be another tour and another album, then it’s fucked up. You can’t really do it, you know, so, right now, I’m not assuming anything about next year, apart from some shows that I’ve got in May, um…but, uh, you know, if you have the attitude that, like, just met some young German and you really want to do something with them, it’s, or if you just met some piece of German software and you really wanna do something with it, it’s fundamentally the same, so on that basis, we will continue to do things, but I don’t know what they’re gonna be. 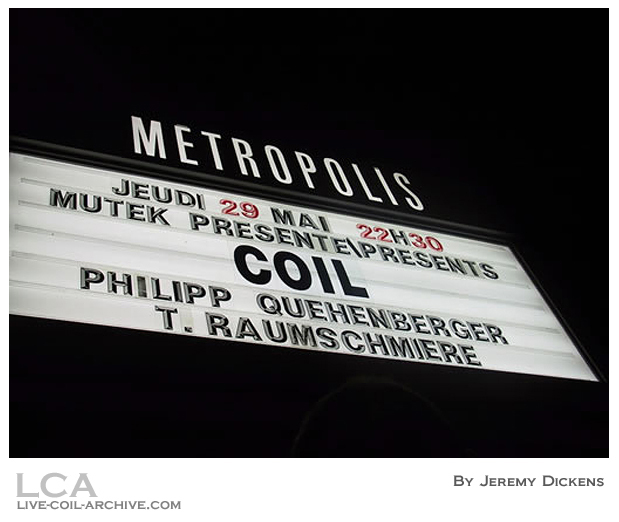 Douglas Roark attended this gig and remembers: “Saw Coil in Montreal in 2003. I drove 1000 miles in one day ’cause I didn’t want to spend extra money on hotels. I’d never been outside the U.S., I’d just graduated from college, and I wanted to treat myself to the MUTEK festival. It was a bummer that John wasn’t there, but all things considered, it was a great show. The interesting thing is that Coil was the opener. Philipp Quehenberger was next, then T. Raumschmiere. (Backwards, indeed.) Needless to say, most people left when Coil was done. Who knows, maybe Sleazy was up past his bedtime and needed his 40 winks, explaining why they played first. 😉 I did see Sleazy in the crowd not long after Coil finished. He talked with a few fans and then split, as I recall. I started to approach him but got nervous and backed off before getting there. Anyway, the CSO DVD is, to me, a reasonably accurate memento from that night. Obviously the sound and the vibe in person was much more powerful. I think somebody once talked about surround sound in the venue? I don’t recall that but maybe it was rigged up? Whatever. It was a lovely night, with a lot of excitement in the crowd. 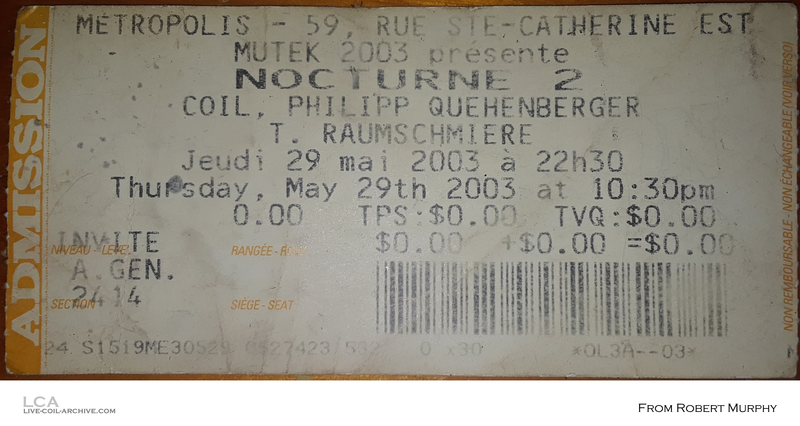 Nathan Ketcham attended this gig and remembers: “I also saw them in Montreal and my whole experience was as equally absurd, in many ways, as my NYC trip (see above)…but I won’t go on about it here. SBD #1a 10/10 Yes 62 min M0 (? ), FLAC Recorded on 24k. digital multi-track. Many versions and remasters are circulating with various alternate indices. SBD #1b 10/10 No 8 min M1, FLAC “Radio Weston” only. Officially released on the 2004 original release of Black Antlers under the title “Wraiths and Strays (from Montreal)”; this release appears to have remixed/remastered the song. 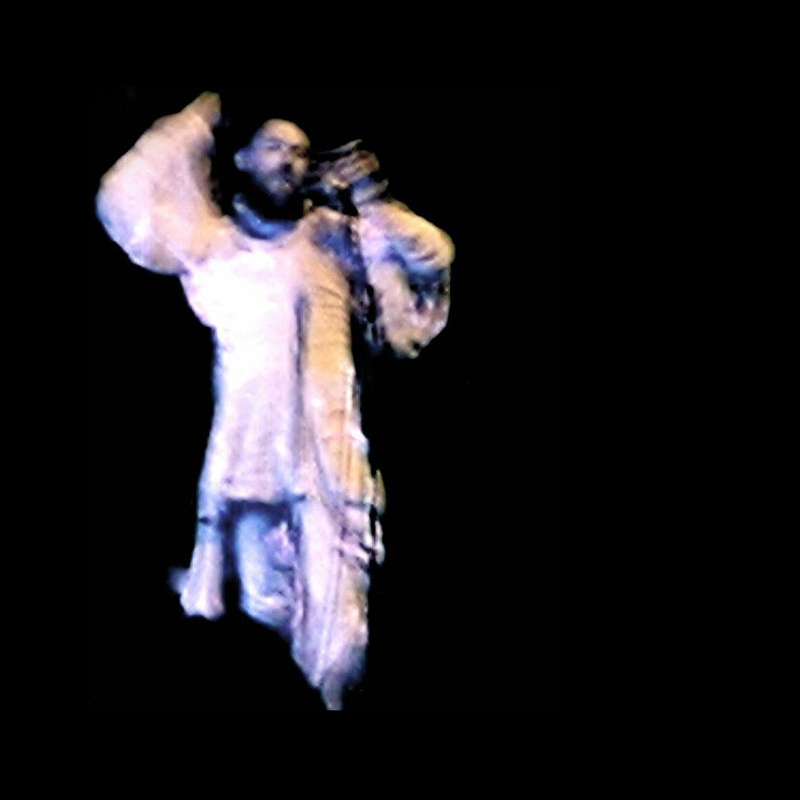 AMT #1 3/10 No 30 sec M?, 320 x 240 AVI One 30-second clip of “Blue Rats,” shot from the front of the audience. AMT #2 3/10 No 1 min M?, 320 x 240 MOV Two 30-second sections of “Triple Sons...” and “Radio Weston,” shot from the front of the audience. EDIT 10/10 Yes 62 min M1, MKV 5-camera angles (professional). Uses SBD audio. Officially released as Colour Sound Oblivion DVD #10. 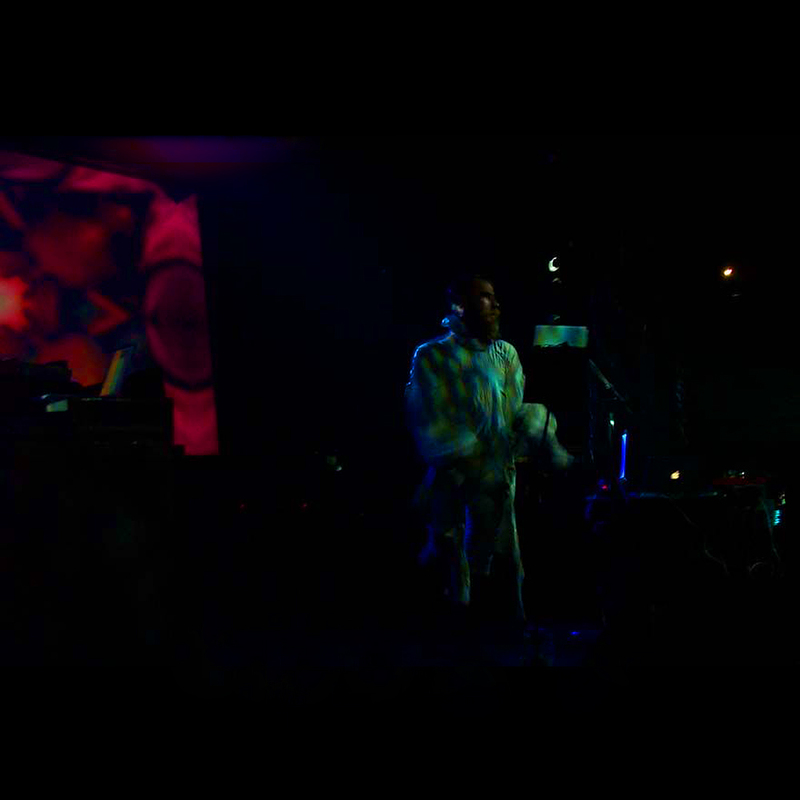 Surfaced in lower quality sometime pre-CSO. SBD #1a – Recording download link (archive.org). AMT #2 – Recording download link (archive.org). 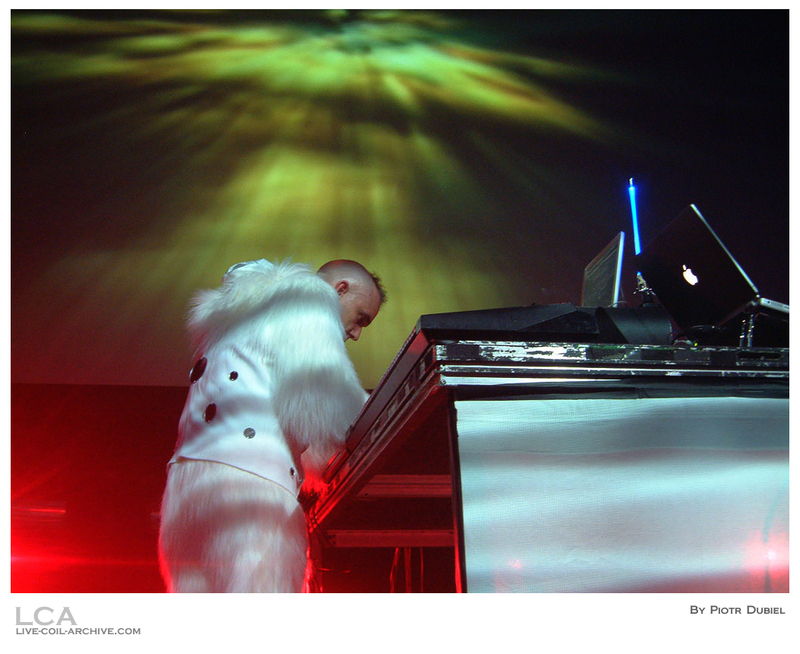 EDIT – (Colour Sound Oblivion DVD #10) – Recording download link (archive.org).